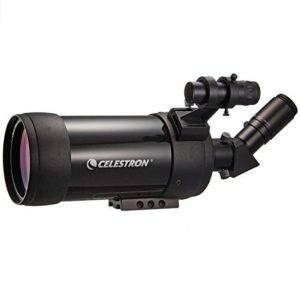 Unlike most of its competitors, Celestron decided to use high-quality metal for the sake of both durability and neat design. Having that in mind, the Celestron 52268 C90 Mak Spotting Scope is definitely an unimpeachable long term investment. The image finder with its 8×12 configurations and a wide field of view makes locating objects a breeze. The magnification of this scope is fixed at 39x, more than enough even for those long distance shots. The maximum level of magnification you can theoretically get out of this beast is a staggering 210x. The C90 comes with one eyepiece included, at 32mm, which enables great image clarity. With it, you can even see Saturn’s rings in the right conditions, and when properly aimed, adjusted, and focused. As well as the 20-60X 80 Porro Prism by Gosky, the Celestron 52268 C90 also features an angled body, for extra ease and comfort while operating the scope. The previously mentioned metal body may be a bit on the heavier side, but ensures great protection for the optics inside. Weighing in at 2kg, you’ll certainly feel it in your backpack, but it’s more than worth it. A tripod is available for purchase, but unfortunately, it doesn’t come with the initial package. The focal length being 1,250mm surely differentiates the C90 from its competitors. A focal length of that value is crucial for a good perspective, angle of view and depth of field. 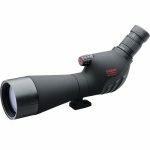 With a close focus distance measuring at 4.5 meters, you will be amazed by the details this scope can capture. Whether those details are color patterns on a bird’s feather or the mesmerizingcolors of the stars above us, the Celestron 52268 C90 is sure to deliver a crystal clear and detailed image. The only real imperfection here is the lack of waterproofing. This may not be a huge problem if you’re planning on using this scope purely for astronomical viewing, but do keep in mind that optics, in general, are delicate and susceptible to damage by water. 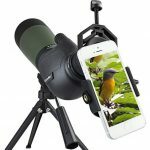 Keep your Celestron 52268 C90 nice and dry, and it will live to see many more stars, birds, or bullet holes, depending on what you use it for.